I pulled into the last available space in the small parking lot off Highway 89 that flirts with the western shore of Lake Tahoe on a beautiful late-spring day, the teal and cobalt-blue water of Emerald Bay sparkling about 450 feet below me. Past the signs warning of the steep trail ahead and the you’re-on-your-own advisory, I began the one-mile descent along a switchback trail, mentally registering the challenge of the uphill return. I was subjecting my knees to this mild punishment to reach an oddity that intrigued me — a little bit of Scandinavia in this most unexpected setting. 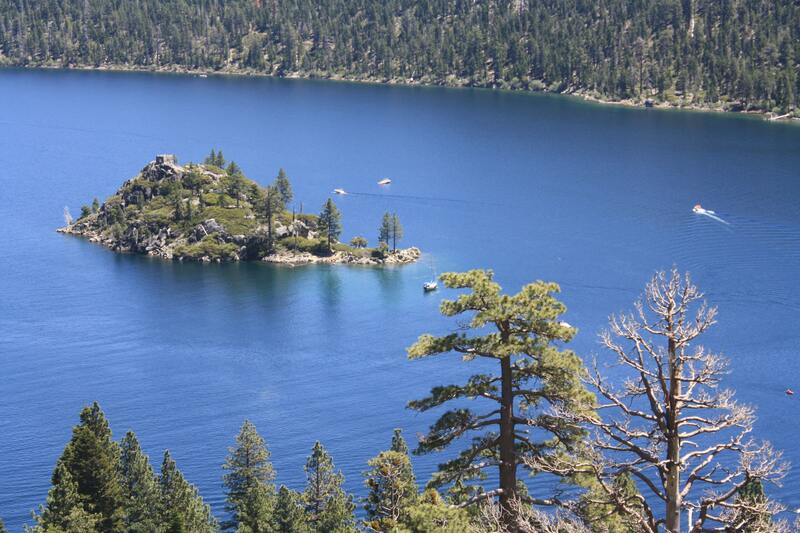 Fannette Island and its private tea house in the blue waters of Emerald Bay. Through the trees, continually shifting views of the bay, the lake, and the lake’s only island, Fannette Island, kept me enthralled. Once I reached the shore, the stone and timber mansion appeared just beyond the beach, in between the magnificent cedars and pines surrounding it. Today, Vikingsholm — the brainchild of one Lora Josephine Small Moore Knight — is listed on the National Register of Historic Places. But when it was built in 1929, it was simply her 38-room summer home. Lora Small was born in 1864 to a family that eventually held substantial interests in such large companies as Diamond Match, National Biscuit, Rock Island Railroad, and Union Pacific. In the 1880s, she married James Moore, and they had one son, who married into the Fargo family (of Wells Fargo fame). Both her husband and son eventually died, and she remarried, to a St. Louis stockbroker, Harry Knight. They were principal financial backers of Charles Lindbergh’s successful flight across the Atlantic. Less successful was their marriage, and the couple split. After they divorced, Lora, now in her sixties and perhaps seeking to wash away the memories of these early tragedies and disappointments, purchased a large swath of land along the lake in 1928 — more than 200 acres of prime real estate, including Fannette Island and the only waterfall (Eagle Falls) flowing directly into the lake — for $250,000. The exceptional site boasted incredible views of the bay, the island, and sheer granite cliffs around the water — a perfect locale to erect a summer home. 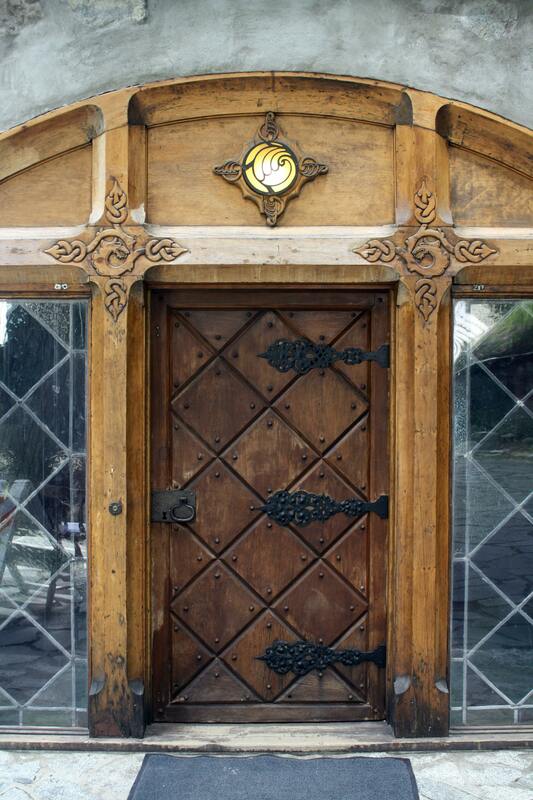 Vikingsholm’s sturdy door wouldn’t look out of place in a Norwegian castle. Emerald Bay reminded her of the fjords she had seen on her travels to Scandinavia, and that, combined with her admiration for the Nordic architecture of the home that Lennart Palme, her nephew by marriage and a Swedish architect, had designed for himself in New York, prompted her to decide she wanted something Nordic for her home. She commissioned Palme to design the plans, and the two immediately set off to Denmark, Finland, Norway, and Sweden to gather ideas they wanted to incorporate in Vikingsholm. They visited ancient buildings, noting particularly attractive details and styles from 11th-century wooden churches and homes in Norway, and stone castles in Sweden. Construction began as soon as they returned with strict instructions from Lora to Palme not to cut down a single tree on the property — and he didn’t, which helped me to understand the odd position of a tree or two as I circled around the mansion and explored its peaceful inner courtyard, kept company by a couple of busy chipmunks. With the foundation completed, construction was temporarily suspended during the winter of 1928 and started again the following spring, when 200 craftsmen descended on Emerald Bay to hew the timbers, carve the intricate designs, plane the wood for the interior walls, and forge the ornate iron hinges and latches — all by hand. Just about all of the materials used to build the home came from the Tahoe Basin, with the exception of leaded glass imported from Sweden. Trees were chosen for their size and lack of knots, and stoneworkers quarried the granite for the foundation and walls from behind the house. 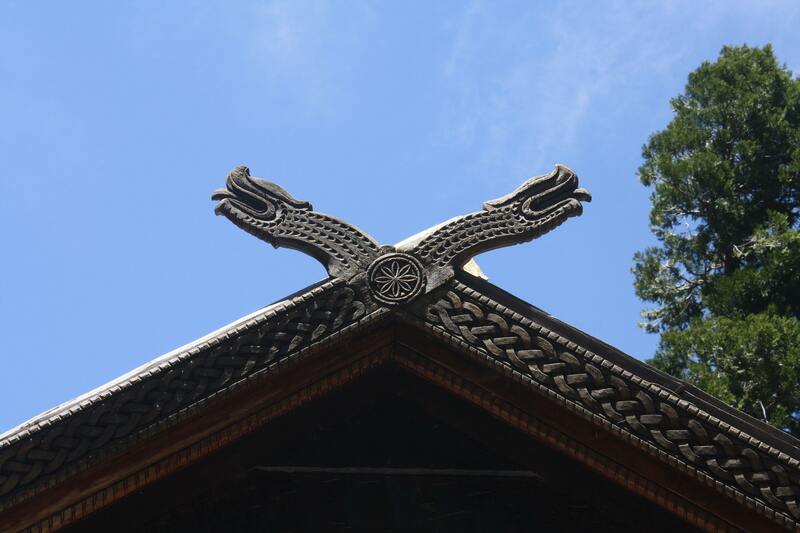 Dragon head details along the roofline conjure up images of the Vikings’ glory days. I marveled at the outstanding features of Vikingsholm and the enviable craftsmanship throughout, including the sections held together without nails, pegs, or spikes, in imitation of old-fashioned construction methods; the granite boulders embedded in mortar; the carvings both around the doors that resembled those on old church entrances and extending along roof ridges, with dragon heads crossing at the peaks; the alluring Round Room; and the steeply pitched roofs, including the two sod roofs blossoming with wildflowers on the north and south wings of the home. 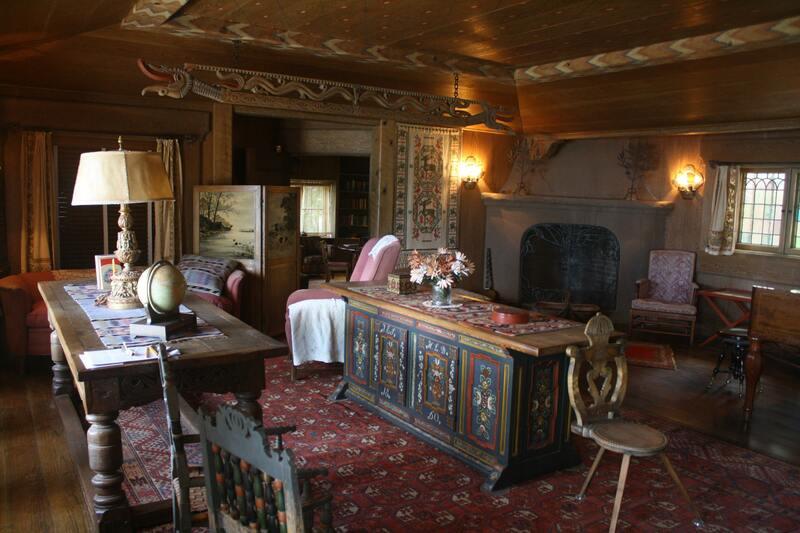 When I stepped into the house, which includes seven bedrooms and seven bathrooms, I found a seamless continuation of the Scandinavian motif, and during the course of my 30-minute tour, I discovered delicate paintings on ceilings and walls, half a dozen Nordic fireplaces, and two intricately carved beams with dragon heads, modeled on beams in Viking castles, suspended from the ceiling in the living room. Lora carefully selected furnishings that reflected typical period pieces used in Scandinavian homes. She purchased a number of antiques in the Nordic nations, and when pieces she admired were not available for sale, she hired craftsmen to reproduce them in exact detail, right down to the aging of the wood and duplication of scratches, such as the brightly painted reproduction of an 1860 bridal table in the living room. Cozy interiors feature an abundance of Nordic furnishings and details. When the home was completed in fall 1929, Lora and her staff of 15 moved in to Vikingsholm and almost immediately opened the house to countless guests. The Depression didn’t hit her very hard, and she spent her summers here until she died in 1945. During that time, she always had a home full of guests, their visits ranging from one night to the entire summer. Each day at Vikingsholm presented a relaxed, apolaustic agenda of diversions and activities — swimming, hiking, horseback riding, sailing around the lake, or driving around its circumference (in which case she made sure their cars were washed and refueled when they returned). Sumptuous meals gathered everyone together three times a day. Tea was served every afternoon on the terrace or in the library, and occasionally in the tea house that she had built on Fannette Island but utilized only a couple of times each summer, as she and her guests could get there by boat only, after she turned down Frank Lloyd Wright’s offer to build a bridge to the island. Lora’s generosity extended well beyond her guests. She contributed to youth groups in California and Nevada, and she sponsored select women — and any child of any of her staff members — to go to college. After her death at age 82, the home and property were resold a couple of times before being acquired by the State of California. Today, as part of Emerald Bay State Park, Vikingsholm provides a reminder of a quiet, elegant, subdued and long-gone way of life in an ineffable setting that arrests your attention and infuses calmness into your very soul.